This is the thought that Henryk carries in his mind as his family is being transported to Siberia from their rural home in Poland. Despite his youth, he can sense the turmoil that is uprooting them and the violence that will come, and can only hope that Helcia and her poetry will help make sense of it all. In Maps and Shadows, the novel released this month by Krysia Jopek, we see how this small family of five is transported on a journey far more distant than Siberia. 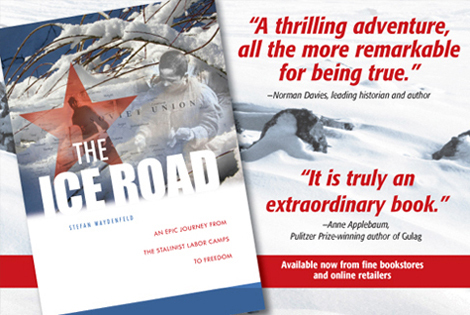 The story is tightly based on the actual events in Poland and Russia, and beyond, from 1939 to 1955. It was painful yet fascinating to read about the resilience of the people whose lives were uprooted so viciously and repeatedly. Only their family ties remained valuable to them as material items were so transient. They had to endure the frigid cold of Siberia and then relatively quickly try to acclimatize to the heat of Africa, and their health was forever compromised by the years of malnourishment and mental anguish. 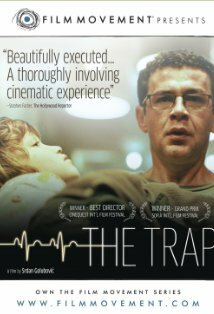 Kopek’s tactic of letting each character explain their own interpretation is revealing as it shows the more personal suffering of each: a father tormented by his inability to protect his family, a mother desperate to see that her toddler have milk, and the two older children trying to put on a brave face to alleviate the worry of their parents as they themselves are forced to grow up far too soon. To be paid on time. 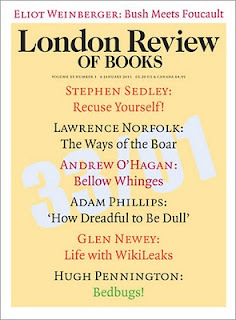 In all, the novel was fascinating in style and content, as were the new aspects (to me) of post-Siberia rehabilitation. It’s evident that Kopek did tremendous research (the bibliography is extensive) on the historical events, and the history itself is never dull. However, a few times I wished there might have been more narrative regarding the personal emotions of each of the four characters-did anyone ever really lose their temper? Break down in hysterics? Fight over petty things? Do the wrong thing? They seemed remarkably focused and devoted despite all that happened, almost a bit idealized. This isn't to say they weren't believable, I just think that the novel could have expanded to include more intimate and informal subjective details. Special thanks to Debra Gendel and Aquila Polonica for the Advance Review Copy. This titled released earlier this month. All of the "best of" year-end booklists that I've been reading have made me consider where I found my year's favorite titles. Granted, many of my favorites have been review copies, but they were sent with the understanding of what kinds of books I like in advance (literary fiction, translated works, poetry, etc). 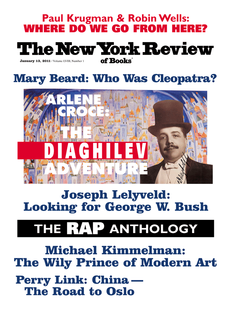 Graywolf Press, Archipelago, Aquila Polonica, and Melville House especially seem to put out really great stuff that I love. So, beyond those, where have the best books been found? And what hasn't worked? A big winner for finding unique titles...visit the blog roll to the right to find some great reading. Much of what I've purchased has come by means of recommendation from these other bloggers who enjoy non-mainstream titles. Lisa's Other Bookshelf is a great example...Also, the blogs for Open Letter and the Quarterly Conversation consistently discuss titles of note. FriendFeed is also a great way to combine feeds from different blogs and get a weekly update. Updates on Goodreads: More helpful than LibraryThing's recommendations, the Update feed on Goodreads is really cool to see what your friends are reading. Besides blogs, this is my main place to find a great title...I'm always happy to see what Irene, Erma, Daisy, Lisa, Tara, and Chrissie are reading! 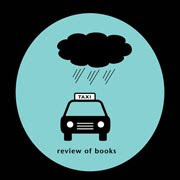 The New Yorker and Rain Taxi seem to be the only print magazines that feature titles that look interesting...definite win! Rain Taxi features smaller presses usually, and even the ads are helpful to discover new reading avenues. 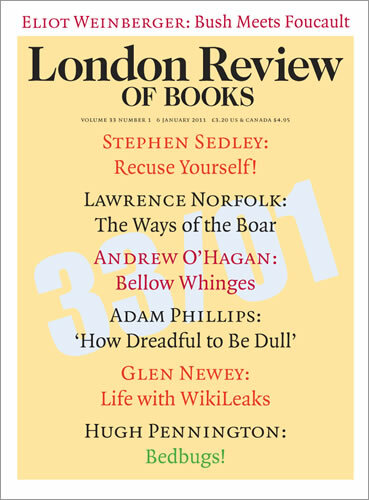 While I just had to have subscriptions to the New York Review of Books and the London Review of Books, I probably won't resubscribe. These look scholarly but too often feature political titles or the usual suspects, maybe only one or two books out of each issue appeals to my off-the-grid tastes. They do have advertisements from university presses that list interesting titles...and of course, the personals sections aren't to be missed. But to pay that kind of money and only read the personals, nahhh. Not worth it. Bookmarks magazine has to be the worst of all...there's not even personal ads to laugh over. All the magazine does is compile the reviews of other media outlets, summarizes them, and regurgitate pages of the same books all the time. Over a year, I haven't found a single title that looked interesting in this magazine. Book Pages, however, can be found free at most libraries and is far more comprehensive. Retail sellers: Barnes and Noble often doesn't have titles that I'm looking for, and that goes for the website and the local store. My local Borders has a great layout but way too much merchandise and too little in the way of literary fiction. When you go in for a classic, and can't find it, you know they're not going to have a book from GLAS or Object Press. And while Amazon.com seems to be bashed as the online bully, at least they continually have the books I want. Small press or big, it's there. Not to be ignored either is that they often help me in finding similar titles. I go to the site looking for one and end up with five. With the 2-day prime membership, it's almost instant bookie gratification...plus I can throw in a toy for the kid and never have to leave the house. Newspapers: the Sunday NYTimes and LA Times are both helpful but their coverage is limited. And it keeps shrinking! Often they are dissecting the same titles as every other outlet (Freedom?). I will still keep up with the LA Times, if only to look for the elusive perfect book via the obituaries section....I have it on good authority (you know who you are!) that the obits is the place for great books! After last year's successful Scandinavian Reading Challenge, The Black Sheep Dances is excited to begin a new challenge. The 2011 Eastern European Reading Challenge starts January 1, 2011. 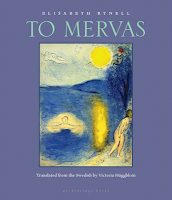 Please consider choosing unfamiliar titles, especially those that are translated works, to help support those organizations that are working to unearth the 'buried' treasure of Eastern European and Russian literature. To enter: indicate by comment below of your intention to enter, with email contact (or email me directly) and your country of residence (important!). I'll compose a upper TAB on the top of TBSD's home page to keep track of entrants. SHARE your favorite titles in a comment, or email me. I'll attempt to create a badge for the Challenge to post on your blog (or you can right-click the photo below), and hopefully you can help publicize the event via FB or Twitter if you wish. The titles below are just a variety of suggested titles depending on what regions you are interested in, and I will update it soon. Additionally, I have the titles below on hand for reviewing, so you'll see reviews of these popping up during the year. Talk about a timely book! This novel is based on Theodore Odrach’s own life when Stalin’s Red Army came in to power in Belarus. Given that Belarus is very much in the news this week, with the controversy over recent elections and the beating and deportation of several journalists, it seems that a glimpse at its history is appropriate. The pressure to succumb to the indoctrination is great; if he doesn’t conform he will be shipped away to Siberia. Anyone can endanger him, as just the simplest lie about him from a student or associate will be enough to remove him, because the regime rewards those who inform. With a starving community and hostility around, every word he speaks endangers him, and yet “even silence could bring disaster”. The story of how he moves through this virtual minefield is both surprising and inspiring. What is especially revealing about the novel’s voice is its coverage of the subject of languages. Having read a few Stalin-era books lately, I hadn’t quite caught on to how language itself is a tool of indoctrination. In Kulik’s rural village, the villagers normally spoke Ukrainian. Having been previously invaded by Poland however, they had been impelled to only speak Polish before reverting back to Ukrainian. Then the regime change insisted that they all speak Belorussian, but made clear it was a stepping stone to the entire area speaking Russian. Without access to their native tongue, the people had much of their culture stripped away, long before the Red Army came in and further eliminated cultural distinctions. Germany eventually occupied Belarus as well, which adds yet another linguistic layer to their history. The language issue is significant because even now in Belarus, as its citizens are divided because those who wish to retain the Belorussian language and cultural identity (in order to prevent further “Russification” of their region) are outnumbered by those who wish to embrace the Russian language for simplification and economic benefit. The loss of one’s native language means the loss of unique phrases, idioms, and subtle historical details. The poet Valzhyna Mort is one writer who is fighting for the language, which she describes in parts of her book Factory of Tears. Wave of Terror also answered a question that had been gnawing at me. Why did the people let the Red Army take over? Why didn’t they resist more? In the narrative, a key element made a great impact on me: the people were hungry and without basic necessities. In this state of desperation, any change was embraced, even if it meant turning on lifelong friends or family, and even if the promised changes never materialized. Stalin’s leaders offered food to hungry people, and although they didn’t get much, they were easily manipulated. It’s the same sort of manipulation that Hitler used to great effect, as well as the Roman Caesars who were able to draw crowds to the gladiator fights with the promise of food. Without the essentials of daily life, oppression can easily take root, because the ordinary person has so little to lose. Lastly, despite all the fear and suffering endured, it was interesting to read of what doesn’t change. Old married couples still fought and young people still sought romance. People still danced and enjoyed a drink and found pleasure in the simplest of foods. Perhaps this was the key to survival-maintaining their humanity and dignity when others lost their own. Special thanks to Erma Odrach for the Review Copy. 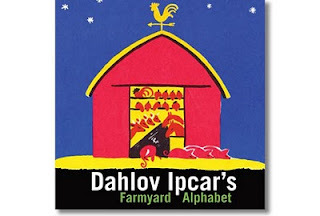 I've raved about Dahlov Ipcar's children's books before. The Cat at Night is an all-time favorite because of the knockout illustrations and the subject matter itself (your cat's adventures while you sleep). 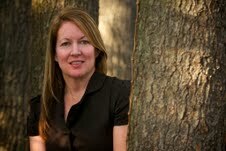 So I was thrilled to have the opportunity to review two more of her books. Both are unique in their own way. The first is The Calico Jungle. 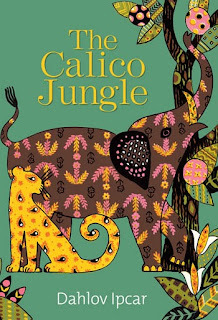 It's a story that is illustrated with quilt prints in retro colors making up the body of the animals, as well as vines and flowers. My son has enjoyed it several ways. First, the storyline, and then it became an "I Spy" sort of activity as he looked for the different animals that are hidden throughout, ordinary animals in a calico print. The colors are not typical children's book colors: instead of primary or pastels, the colors have a milk-paint opaque look that feels vintage. According to a representative of Islandport, Ipcar actually has a quilt in her home that she used for inspiration, and at one point she envisioned the book being cloth. The story itself is of boy who is given a quilt lovingly made by his mother, covered with animals. That night he is transported into dreams of all the animals and their adventures. It occurred to me that if my son was younger these pages would have looked gorgeous framed and as part of a nursery theme. Dahlov Ipcar's illustrations are never cutesy or sacharine sweet-they are just simple and clear. And how is it that the face of a calico camel can show emotion? I'm not sure how she does it, but we love this book. And as always with Islandport Press, the book's pages are heavy and bound beautifully-a book I can easily see saving as an heirloom. In terms of age-appropriateness, my three-year-old easily enjoys the story and is likely to continue to enjoy it when he learns to read, so I think it would be fair to say it could go from a lap reader to a school-age child. 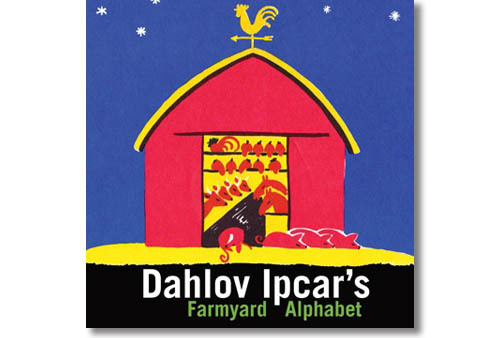 The other book is called Farmyard Alphabet, also by Dahlov Ipcar. This is the first of her books to become a board book, and it has similar qualities in the unique vintage colors that she uses. The illustrations are done in a European folk art style, simple but not cutesy. Ipcar is unusual as a children's illustrator in that she uses the color black occasionally to great effect. Most kid's books seem to avoid black, and I'm not sure why. But the colors of the varying animals pop against the squares of black that alternate with other colors in this board book. The theme, obviously, is the animals in the farmyard. Geared towards babies, and non-toxic of course, my son still enjoys reading it despite his "I not baby" status. These books were received as Review Copies from Melissa Kim at Islandport Press. "How many trees is a forest?" 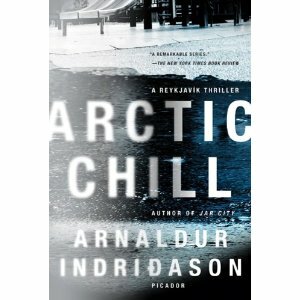 Arctic Chill is part of a series of police procedurals by Arnaldur Indridason. 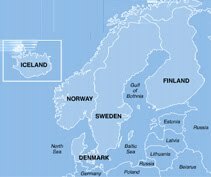 Set in Iceland, the cold climate plays its own role in the mysterious death of an eight-year-old boy. Three detectives, each complicated individuals on their own, combine their efforts to search for the murderer amidst the suspicion that the murder was racially motivated. Suspense was present throughout, and many of the characters involved are not the typical detective novel stereotypes that often show up in a successful series. The case doesn't have an easy resolution, and the detectives are not the Hercule Poirot-type of mentalist who seem to rely on hunches. Instead, real detective work, involving tedious interviews, re-analyzing evidence, and following leads is the way the murder is solved. You don't often see this much focus on the little repetitive details of detective work in crime novels, as some authors may think it's too trivial to be of note. Yet in this, it really works. In fact, the very unspectacular and terribly unglamourous procedural work is what creates the suspense. I enjoyed the novel immensely-it was a great cold weather read. And since I've been reading so many Icelandic novels recently, some of the descriptions of the locations felt familiar and made the story more personal. I haven't read any of the other books in the series, if I had, I may have even enjoyed it more. Because for me, one distraction was in the beginning of the novel when the three detectives begin the case. I was confused as to who was in charge, and it seemed like equal weight was given to each of the three. I'm not sure why, but it felt disorienting, like I really need to know who the 'lead' was to get involved. And by half-way, I understood. But until then, it nagged at me a bit. Those familar with the series obviously wouldn't have this problem. Other small details bugged me: one was that there seemed to be several threads of storyline that were irrelevant to the story but were probably far more important in the series. That's fine if each reader knows that it's part of a package; for me, there wasn't enough substance to the threads to make sense of why they were present, and they seemed to slow down the narrative. Finally, one especially obvious blunder (eventually set right) seemed easy to spot...it foreshadowed far too much and made me question one of the detectives capabilities. Lastly, while the detectives were interesting, I didn't find any personal draw to any of them...their hard work and intelligence was apparent, but nothing about them made me really care about them as individuals. In all, this was an absorbing read, and I do plan to read more in the series. A special comment has to be given to the beautiful way in which he describes the landscape and light that remains in the background of the scenes. I'm curious to see if my take on the detectives will change after I read more of the titles. The next one after this is Hypothermia, which I've heard nothing but good about. 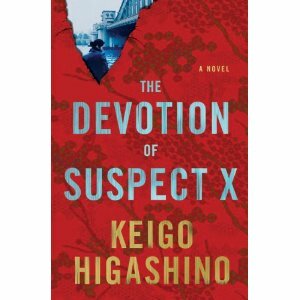 The Devotion of Suspect X is due to release in February 2011 in the US. It's an extremely tight-paced crime novel that features unique lead characters and a style of detective work that may not be familiar to US readers. It takes place in Japan, and besides the great detective aspect of it, it also gives a fascinating glimpse into daily life among the middle-class. Additionally, it's interesting to note that immediately upon starting it, you know "whodunit"; yet the resolution is far more complicated. It's the kind of story where even the most minute detail will come into play at some time further in the story. I've read it and my review won't be posted until the release date. However, the publisher sent an extra ARC of it, so I'm offering it to readers in a US only giveaway. The usual rules apply: be a follower of this blog and leave a comment to this post. On January 5, I will pick a random commenter to win. Please make sure you use GFC or leave an email address for me to contact you. Please note, this is an Advanced Review Copy (paperback), not a final copy. Again, sadly, US only. I'll admit, flat out, that I don't yet own an Ereader. And really, unless it is an Ipad, I'm not terribly interested in having one. Convenience seems to be the biggest factor for purchasers, and there's no doubt the instant access is pretty cool. And they look cool too! While some owners complain about glare, battery life, and the feel of the plastic, others find that the convenience and ecological interests makes up for these problems. However, as an avid reader, especially of history books, I can't help but wonder if there's a factor missing in the debate: illustrations and photography. I've talked to a few owners of E-readers of various brands, and asked them if they feel a picture, diagram, or illustration looks the same on an E-reader as it does in a print book. Several were taken back by the question, but most admitted that the impression is not the same as in print. For example, right now I'm reading Angel Island, from Oxford UP, about the immigration of Chinese and other nationalities into San Francisco who were detained on Angel Island. To me, the diagrams of the buildings, the photographs of the people, copies of receipts and intake papers make the story far more personal than had they been omitted. Would that same feeling be possible if I were viewing them in an Ereader? Or would I have just glanced over them? This isn't about pretty little illustrations that simply beautify a page. I'm more concerned with historical details, as well as the shock value of a photograph (see Susan Casey's The Wave for knockout photos! ), that contribute substantially to the facts of the book. They don't embellish, they clarify or expose. In a print book, they can be studied to discover every nuance. In addition, besides the publishers that are hurt by loss of print books, what about illustrators and format designers that are equally or more impacted by the switch to Ereaders? Will the Ereading experience be all about the convenience so much that we don't appreciate stylistic details? After all, there are those that spend a great deal of time designing the particular layout, font choice and size, and "look" of a print book. Is that lost on an Ereader? I'd love to hear opinions from those with Ereaders to weigh in with their impression of the way of illustrations or photographs are seen on an Ereader, and any differences they find. Is it a significant consideration? 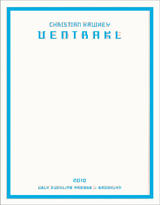 Check out my review of Christian Hawkey's Ventrakl in the newest edition of Rain Taxi. Hawkey takes translation in a completely new and organic (literally!) direction. If you are a fan of Georg Trakl, the German poet, you'll really enjoy it, as well as the rest of the issue. Vol. 15 No. 4, Winter 2010 (#60) now on sale at http://www.raintaxi.com/. This full length literary magazine reviews fiction, poetry, graphic novels, and non-fiction, as well as covering topics of contemporary literature. I have to confess that I have a huge crush on San Pedro, part of the Los Angeles docks near Long Beach. I love everything about the town. For one thing,there's the large Croatian population that makes words sound beautiful to me (I love me a Slavic accent!). But the main draw is the docks and waterways themselves. I’ve always stayed in the same hotel five times, and have watched it go to seed (truly a dump now! ), and will still stay there for the incredible view. The port retains a sort of romanticism for me. At night I can barely sleep for watching the cargo ships enter and depart, silently in the very black waters. The lights and cranes lit up at night make the water sparkle. Who needs sleep with that outside? 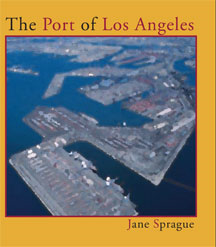 It was with this in mind that I was eager to read Jane Sprague’s The Port of Los Angeles, which I assumed would be a tribute to the dark mysteries, unnamed travelers, and the strange sort of thrill of long-distance, but old-style, slow travel. I was wrong. 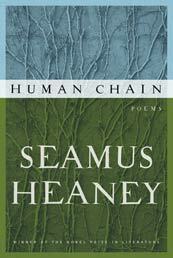 The poetry itself is still lovely but its theme is far different. Instead of romanticizing the mechanics of it all, she analyzes the concept of consumption and the rabid activity of consumers to have more material objects, even at the risk of pollution and damage to the sea. Her style is unique, as the enjambment is unpredictable. In doing this, she makes the reader pause to consider the significance and the placement of just the right word. For example, in the excerpt below, her placement of ‘waves’ on its own line reveals another meaning. Setting apart the one word, having just read ‘California’ a few words before, creates a mental picture of California’s beaches, with the powerful waves beckoning to tourists. And yet she shows, through further verses, that California’s appeal is just as much in danger as the sea itself: crowded, polluted, and a commodity to exploit. The image she creates here is the ideology, so popular in California and elsewhere, of the efforts people make to simplify their lives, live green and lessen their carbon footprint. Yet in doing so, they’re actually creating another industry and only changing their types, not habits, of consumption. She cites IKEA often as an example of this desire to minimize and streamline a lifestyle, but often simply consuming more or the same amount of different things. People go to IKEA, or any store really (she's not just picking on IKEA), to change their lives through products, rather than change themselves. Her frequent use of the adjective 'small' contrasts with the reality of how modern people live. She refers to consumer habits often, and considers what is contained in the ships, the cargo destined for Costco and the mall: “hundreds of plastic things shaped for fixing mending catching all manner of debris.” She doesn’t back down from her poetic assertion that the sea has become a highway where only the beginnings and endings of the journey matter. She transcends this by recognizing this is how many people live their lives: too focused on destinations rather than the journey itself. In this case, rather than consumerism, she illustrates the way modern life makes people compartmentalize their feelings, cutting their emotions up and placing them in various rooms and spaces, no longer able to connect the pieces. Sprague’s style is unflinching and bold, and there is no sentimentality or romance to her version of what the port symbolizes. Sprague doesn’t change my love for San Pedro, or the port. I’ll still have that fondness for the black water and the busy docks under starlight. But her collection here does reveal how meaningless good intentions are if people remain resistant to change. Special thanks to Chax Press for the Review Copy. After a run of some really great reads, I have to say it ended with this so-so book. The concept was so amazing that I was really looking forward to it, but it left me confused and ambivalent. 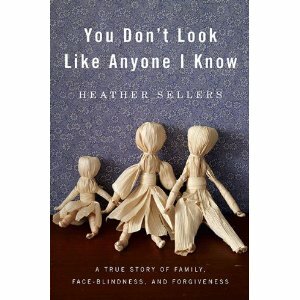 "Prosopagnosia" is a condition that author Heather Sellers has, wherein she is unable to recognize faces. (At first I thought, lucky her! There are faces I'd love to forget!) She isn't diagnosed until her late20s and into her 30s, and so the difficulties she had prior to that she attributed to some sort of 'craziness' on her part. She didn't know what was wrong because it was all she knew. It meant that at times, she didn't recognize family members or friends, even up close. Instead she recognized them by their mannerisms, voice, and the usual location that they appeared coincided with where she expected them to be. A rare disorder, it is thought that the condition can be caused by emotional trauma, but all the facts about it are not yet known. But trauma? It's here. I don't mean to sound flippant, because this is her real life and there's nothing light about it, but there is more trauma in this girl's life than most anyone can imagine. At a few points I was reminded of James Frey's A Million Little Pieces, not because of his dishonesty, but because when I read it, I would think 'this can't get any worse', and then I'd turn the page to find that, indeed, it gets worse. Her early life was lived with her schizophrenic mother who was categorically insane and kept her from ever sleeping more than few hours, but didn't appear to have any medical or psychiatric care, at least not an official diagnosis. Sellers didn't have the advantage of knowing things were messed up, she only suspected it and internalized it. Her father was a cross-dressing drunk, who borrowed her nail polish and who was marginally less crazy than her mother. She rotated between their homes, where food, cleanliness, and basic normalcy was never present. The book starts with her making a trip to visit her parents, and the madness that ensues when she introduces them to her boyfriend and his sons, all after she's become a successful author. It appears to be the first time she realizes that they are ill, and from there on, she explains how she recognizes that their illnesses likely influenced her own, and how she came to readjust both her thinking about herself and her feelings toward them. It sounds like a lovely ending for such a traumatic beginning. But several factors weren't addressed, and the omissions bothered me. First, as she comes to her realization that they are very, very sick, she's in her late 20s. A successful writer for magazines, she's also earned a Ph.D. and is a professor working towards tenure. A very smart woman to be sure. Yet how could she achieve all that and remain oblivious to both her own facial blindness and to her parents problems? I wanted to hear more about how she was able to teach and achieve her notable success despite her condition. Details, not just a brief overview. Another aspect that bothered me was that in decades of looking back, she was able to recount extensive dialogues of past conversations. So much so that it doesn't ring true. Is her memory heightened by the neurological condition she has, as a blind person often has sharper hearing than others? An explanation would have been helpful. At one point, she relates when a man at a reading questioned her about the believability of her autobiographical writing, and while she admits to being uncomfortable with the question (she says in the book), she related to the man something that another author had said, that "when we wrote fiction, some kind of automatic story generated itself, based on what we knew about what we saw." She never gave him a direct answer, and in this book she doesn't say directly what she meant, but it left an opening that wasn't answered...how much of this can be said to be accurate? So much of the traumatic events she recalls deal with big things, yet she never explains how she coped with being left alone in a dark trailer in the woods with strangers banging on the door. Explaining that she was frightened doesn't go far enough...what exactly did she do about it? While she discusses missing school due to her parents instability, she never relates how she got through a school day. How did she relate to her classmates? What did she eat? How did she do her homework? The extreme details recounted about her parents, some really over-the-top accounts, doesn't mesh with the very few details she reveals about her own survival. Finally, the significant omission of any details from her brother leaves an empty hole in the history. She acknowledges that for his privacy she'll let him decide if he wishes to tell his story. I appreciate her candor in that and her respect for his feelings, but in all of her detailed accounts, one wonders where he is during all of this. Hearing how they related to each other during all this madness would have fleshed out the story even more. It's an amazing story that leaves many unanswered questions. What she has achieved despite tremendous obstacles can't be minimized. It would have been helpful to have had perhaps more details about herself and less about her parental extremes, as the shock value actually made it feel so implausible. Special thanks to Riverhead Books for the Advance Review Copy. 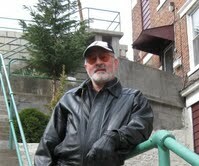 Thus writes Michael Adams in his poetry and short prose collection, Steel Valley. The collection is diverse, but most of it dwells with the historicity of Pennsylvania’s steel industry, one that had dominated the world up until the 1980s. It was known as the largest steel producing region in the world, one that supplied materials, iron, and armor to Union soldiers in the Civil War, and through the 60s and Vietnam (source: www.riversofsteel.com). Special thanks to RD Armstrong for the Review Copy. 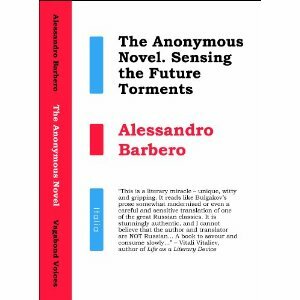 Alessandro Barbero’s novel about Russian life delves deep into the world of Moscow and Baku, yet in an extraordinary way. Rather than build on Russian stereotypes, like the underbelly of crime, excessive vodka, and jars of caviar mixed in with ruthless criminals and historical savagery, Barbero creates an entirely new type of Russian novel. Sure, those elements are present, but they aren’t the focus. The characters are complicated and new. And the provenance of this “anonymous” novel is new too. The novel begins with a manuscript that manages to survive two literal burials in the ground. No one claims to have written it, and it’s stored an indeterminate amount of time. From then, it finally gets published. The voice of the unknown author introduces the reader to several characters in a rather short amount of time. But rather than simply describe them, he actually gets into their head, and at times we read of them in the first-person, hearing their stream-of-consciousness thoughts and intentions. Each character defies type, and all bear a bit of charm. Tanya is well aware of the deception and atrocities that occurred, war crimes that have gone unpunished for many. One typical crime was when an informant rats out a colleague, has them sent to the labor camps, and then assumes their identity. Her research into Soviet party cadres has a personal connection, and nothing is going to stop her, not even the ‘old school’ hardliners that pressure her professor, Obliin, to cancel her research. “I need to know what happened, and to understand history you need to follow it through. You can’t just stop at some random moment. You need to go even beyond…” Her boyfriend Oleg, a journalist, thinks she’s going overboard. Throughout the remainder of the novel he does indeed tie up the threads, making the story serious in the historical aspects yet with a bit of humor and irony thrown in. I can’t say enough about the way each character is built; seeing their inner thoughts as they struggle to do what is right as opposed to what is easy gives them far more depth than just describing what they said or did. On a larger scale, outside of the plot, Barbero comments on the outsider viewpoint of Russian history, and the way it is often revealed only in an interest in the writings of Pushkin or Gogol, “history has simply become a commentary on literature.” He wants to demonstrate that only the famous writers or despicable leaders are what capture interest, rather than this complicated people who have endured decades of hardship. Look into those people, and their lives, to find the answers to the last century, he implies. Special thanks to Vagabond Voices, Scotland for the Review Copy.